BIOMab - EGFR Injection distributors, dealers & suppliers in Mumbai. 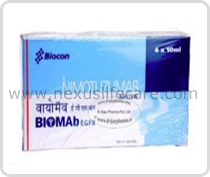 Uses:- BIOMab - EGFR Injection antibody used to treat squamous cell carcinoma of the head and neck, refractory high grade astrocytoma of brain, nasopharyngeal cancer. Side Effects:- Rash, diarrhoea, conjunctivitis, chills, fever, nausea and vomiting, dryness of mouth, asthenia, hypotension/hypertension, flushing.